Jyoti Amge is an Indian woman widely known for being the world's smallest living woman certified by the Guinness World Records. On 21st December 2011, the Guinness World Records declared her as the world's smallest woman. Likewise, Amega has made her television appearances in Bigg Boss 6, American Horror Story: Freak Show etc. Jyoti was once rumored to be married, but is she married? To know all about Jyoti's early life, education, married life, relationship, brother, mother, sister, height, body measurement, net worth, and much more. Jyoti Amge was born on 16th December 1993, in Nagpur, India and holds an Indian nationality. She is the daughter of father Kishanji Amge and mother Ranjana Amge. Amge grew up along with her three sisters Archana Amge, Rupali Amge, and Vaishali Amge and a brother Satish Amge. Amge attended the local school of Nagpur and has her own miniature chair and desk. Besides this, she hasn't shared any further information regarding her educational background. After being recorded as World's shortest woman by the Guinness World Records, Jyoti Amge decided to enter into the Bollywood industry. She appeared in the 2009 UK Channel 4 documentary entitled Body Shock: Two Foot Tall Teen. Similarly, she was also a guest participant in the Indian television show Bigg Boss 6 (2012-2013). Along with Teo Mammucari, Amge co-hosted the Italian channel named Canale 5 in 2012. 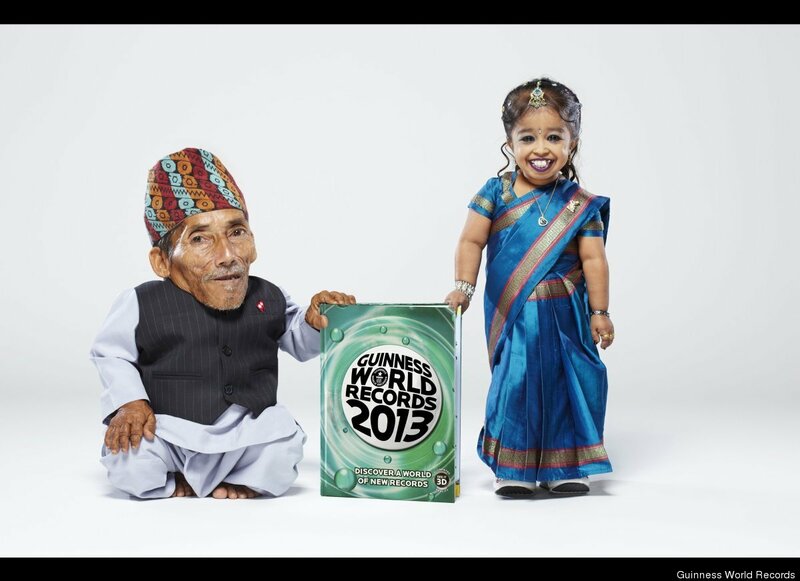 In 2012, Amge got an opportunity to met world's shortest men, Chandra Bahadur Dangi of Nepal and posed together for the 57th edition of the Guinness World Records 2013. Afterward, in 2014, Amge appeared in the fourth season of American Horror Story: Freak Show. She appeared in 12 episodes of the show until 2015. Amge was honored by a Russian International Horror Film Awards in 2015. The Guinness World Record holder, Jyoti Amge is currently 24 years old and has the height of 62.8 centimeters (2 ft 0.6 in). In 2010 and 2011, Amge won the smallest woman title. Moreover, her wax statue is also present in the Celebrity Wax Museum, Lonavala. Amge is not married yet and isn't dating anyone. Furthermore, there are no any records of her past relationships and affairs. In September 2017, Jyoti Amge came into limelight because of her alleged marriage controversy. A person from the United States of Indian origin flashed a fake news along with a photo on the internet regarding his marriage with Amge. Archana further mentioned that the photo was clicked by the man during their tour to the U.S.
Jyoti Amge earns a good sum of money in her career. She also earns an astonishing amount of money from her acting career. She has appeared in the American Horror Story: Freak Show, Bigg Boss 6, etc. through which she obtains a decent amount of money. Joyti traveled around the globe for several tour and programmes. As of 2018, her current net worth of Amge is under the review. But as per her popularity, her net worth is sure to be in millions.